New Glamorgan captain Jacques Rudolph says he will relish the extra responsibility of leading the Welsh county next season. The South African opening batsman will be captain in all formats taking over from Jim Allenby, who has joined Somerset, and Mark Wallace, who will revert to vice-captain. Rudolph, 33, does not feel the new job will be a burden. "I don't see that as a hindrance and I actually see it as a great opportunity," he said. "I'm the kind of person that I want to lead from the front and that's also the style I play my cricket. "I want to lead from the front and try and score as many runs as possible for the team and inspire the players around me." 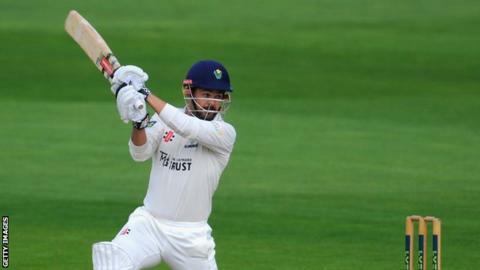 Rudolph joined Glamorgan on a two-year contract in September 2013 and scored almost 2,000 runs in his first season. He signed a contract extension in November 2014 which will keep him at Glamorgan until 2017. Wallace captained the County Championship and 50 over sides last season and steps down after three seasons in the role. Glamorgan head coach Toby Radford insisted Wallace still has a major role to play at the club and remains a key member of his squad. "Mark's a great ambassador for the club and he supports the club as well, if not better, than any other player on the staff," Radford said. "He'll still be involved in a leadership role so we'll still use him and all his experience within the team. "He's still got a lot to offer and he'll still help us enormously."